If the existence of God is not testified to and is denied (God forbid! ), then the idea that every atom is both a judge and a prisoner would have to be accepted. If it is believed that the stones that constitute a building had constructed this building without a master, then the idea that every stone is both a judge and a prisoner would have to be accepted. They are judges because they all agreed to come together to form a building. They are prisoners because they cannot back out of their decision. Similarly, if atoms had created this body instead of God Almighty, the body’s atoms would have gathered and collectively decided to compose organs. In this way, they would have earned the qualities of judging and legislating. Yes, for example, they come together and decide to construct the heart. This decision is a kind of ruling that a judge would make. By submitting to this ruling that they made themselves, they become imprisoned. Since no atom is able to abandon the organ that it produces, it is a type of imprisonment. From another perspective: an atom has had other atoms submit to it, and as a result, it becomes a judge and by submitting to them, it becomes imprisoned. However, it is not possible for an entity to be both the judge and the prisoner. This world has never seen someone who was both a judge and a prisoner. 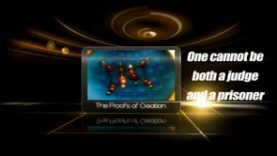 In that case, to disaffirm God, one must accept that these two characteristics exist in the countless atoms of the body. Billions of these kinds of inconsistencies can be found within disbelief. We now complete the proofs concerning God’s existence that form the work, “The Proofs of Creation”, here. However, it should not be supposed that there are only 25 proofs regarding God’s existence. We have proved through the 25 proofs in this work that God exists and that He is unique. Let alone 25 proofs, only one proof explained in this work is enough to prove the existence of God. If you want to find out about the other proofs regarding the existence of God and their explanations, please refer to the 7th Ray called “Ayatul-Kubra” (the Great Sign) written by Badiuzzaman Said Nursi. We believe that when you read it, you will see tens of proofs regarding the existence of God even in a single leaf. 12 # Can there be fruits and flowers on the branches of a dead tree? Do you want to be aware of our new videos? Subscribe to our weekly email newsletter. Amacımız; ilmin kıymetinin anlaşılamadığı ve kitaptan ve kitap okumaktan çok uzak olunduğu şu zamanda; çok kıymetli olan iman hakikatlerini kitaplar arasından çıkartıp, kendi bünyesindeki teknik bir kadroyla insanların anlayıp istifade edecekleri görsel bir formata dönüştürerek konusuyla alakalı video eserler hazırlamaktır. © 2010 Seyrangah TV. Maddi çıkar gözetilmemesi şartıyla telif hakkı ödemeden tüm videolarımızı izleyip indirebilirsiniz.